Samsung's low-cost tablets, the Galaxy Tab 2 (7.0) and Galaxy Tab 2 (10.1), have been delayed, and will now start shipping in the U.K at the end of April, the company said on Tuesday. When Samsung announced the two products in February, it said they would arrive in U.K. stores in March, and then be rolled out globally. But the end of March came and went, and the tablets didn't go on sale. The reason for the delay is that Samsung and Google need some more time to work on Ice Cream Sandwich, according to a spokesman at Samsung, who didn't want to elaborate on the details. Both tablets will run the latest version of the Android OS. When it was launched, the Galaxy Tab 2 (7.0) was expected to be the first Samsung tablet to get the latest version of Android. This is the second official setback for Samsung as it rolls out new devices based on Android 4.0 and upgrades existing products. Last month, the company said the upgrade for the original Galaxy Note would arrive during the second quarter, later than its original plan to begin the upgrade process during the first three months of 2012. However, Samsung has started upgrading the Galaxy S II phone. Other phones and tablets that will at some point be upgraded include the Galaxy S II LTE, Galaxy R, Galaxy Tab 7.0 Plus, 7.7, 8.9, 8.9 LTE and 10.1, according to Samsung. When they eventually ship, the Galaxy Tab 2 models will be available in 3G and Wi-Fi versions. 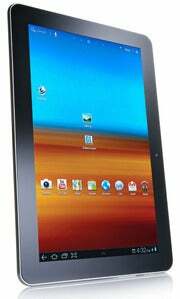 The Galaxy Tab 2 (7.0) has a 7-inch screen with a 1024-by-600 pixel resolution and weighs 345 grams, while the Galaxy Tab 2 (10.1) has a 10.1-inch screen with a 1280-by-800 pixel resolution and weighs 588 grams. Apart from their screen size and weight, the two tablets have a very similar hardware specification, including a 1GHz dual-core processor, two cameras, internal storage of up to 32GB and a MicroSD card slot for added capacity.